Yu-Gi-Oh Forbidden Memories, known in Japan as Yu-Gi-Oh! True Duel Monsters: Sealed Memories (遊戯王真デュエルモンスターズ封印されし記憶 Yugiō Ma Dyuerumonsutāzu Fūin sa Reshi Kioku) is a video game based on the Yu-Gi-Oh! manga and anime series. Much of Forbidden Memories was taken from the preceding Yu-Gi-Oh! video game, the Game Boy Color title Duel Monsters II: Dark duel Stories, expanded upon to take advantage of the much more powerful hardware available on the PlayStation. 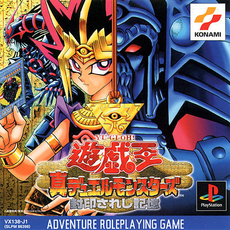 For example, the card list in Forbidden Memories was an almost exact copy of the card list in Duel Monsters II (only two cards were added in Forbidden Memories); the Guardian Star system was based directly on the alignment system in Duel Monsters II, with many cards' alignments translated directly to their first Guardian Star; and the card drop pools in Forbidden Memories are altered versions of the drop pools in Duel Monsters II. The game takes place in Ancient Egypt. The players play the Yu-Gi-Oh! Trading Card Game alongside characters that appear in the series. The game contains 722 cards; the 720 cards featured in Yu-Gi-Oh! Duel Monsters II: Dark duel Stories, plus "Dark Magic Ritual" and "Magician of Black Chaos". The characters consist mainly of characters from the manga. Their roles differ slightly and a few exclusive characters exist. Load: Open a saved game. 2P Duel: Battle against a second player, who uses a Deck from a different saved game. Trade: Trade with another saved game. Campaign: Face opponents through a story mode. Free Duel: Choose an opponent to face from a list of unlocked characters. Password: Use the password menu to unlock cards. The story begins in Ancient Egypt, with the prince of the dynasty, who often spends time at the dueling ground playing against other villagers, and his two friends, Jono and Teana. One night, Atem escapes Simon Muran, his tutor and advisor, to visit the dueling grounds, where he mets up with Teana and a few villagers. After some games, Teana tells him of a festival occurring in the Plaza, and they leave to see it. They watch the mages march around a shrine, holding flags, and Teana comments that the ceremonies are starting to seem darker, assuming that it is the work of the "detestable" high mage Heishin, a sorcerer who leads a group of independent high mages. Teana spots Jono dueling, and greets him just as Jono's opponent, Seto, defeats him. Priest Seto mocks Jono's ineptitude in dueling, and Jono and Teana tell Seto that Atem could easily defeat him. Seto and Atem are about to duel when one of Heishin's aides tells Seto that Heishin requests his presence. Seto agrees to duel Atem later at the dueling grounds. Jono, Teana, and Atem return to the grounds, where Atem has a quick Duel with Jono and defeats him. Seto returns, flanked by aides, and duels Atem, putting on quite a display of ability before Atem claims victory. Seto recognizes that Atem is the prince and says he will meet Atem again. Atem leaves and returns to the palace and is herded off to bed by Simon Muran. As Muran walks away, a guard tells Muran that Heishin has invaded the palace, wielding some sort of strange magic. Muran starts looking for him and finds Heishin destroying the stone columns of a walkway. Heishin confronts Muran and tells him that he has discovered the Dark Power, and uses the Millennium Rod to blast Muran away. Meanwhile, a servant wakes Atem and tells him to run, just as Priest Seto captures her and his aides take her away. Seto tells Atem that Heishin holds the King and Queen captive, and that to run away would result in their execution. Seto then demands the Millennium Puzzle in exchange for a getaway. Atem refuses, and Muran runs up behind him, looking beaten and weak, carrying the Puzzle and telling him to run. Atem runs, but Heishin corners him, and forces him to Duel for the fate of the Puzzle. However, Heishin defeats Atem (the player will continue to duel Heishin until he or she loses), and Muran tells Atem to shatter the Puzzle, even attempting to subdue Heishin. Atem smashes it, and Muran uses some magic to seal himself and Atem into the puzzle. Muran tells Atem that his soul is now locked inside the puzzle, and that the only way to release it is to reassemble it. Muran tells Atem to rest, assuring him that someone will eventually complete it. A millennia later the puzzle is solved by Yugi Muto. Yugi has a dream about the Puzzle's contents before entering a Duel Monsters Tournament hosted by the Kaiba Corporation. After defeating the preliminary rounds by dueling and defeating Rex Raptor, Weevil Underwood, Mai Valentine, and Bandit Keith, he takes a break. Between the preliminaries and the finals, Yugi and Joey are talking when Yugi spots Shadi, and tells Shadi about the dream. Shadi tells Yugi that the person from the dream is his doppelganger and is named Yami. He suggests that Yugi meet him, through his Millennium Key, and transports Yugi into the Puzzle. Yugi meets Atem, and Atem mentally tells Yugi that he wants to return to his own world. Atem gives Yugi six blank cards and disappears. After waking Shadi asks what happened, and Yugi shows him the cards, but neither of them can deduce what their purpose is. Joey informs Yugi that the finals are about to begin, and they depart. The first finalist is Shadi, and after Yugi defeats him, the Millennium Key and Scales are forced into the blank cards. Shadi theorizes that the Millennium Items were drawn together so that Yugi could acquire all of them. Yugi then proceeds to defeat Yami Bakura, Pegasus, and Isis to acquire their items. In the last round of the finals, Yugi faces Kaiba, who possesses the Millennium Rod. Yugi defeats Kaiba and unites all of the Items, which allows Atem to travel into his Egyptian past. Simon Muran awakes Atem in the puzzle, and theorizes that the boy, Yugi, is a representation of the future of Atem. Muran then tells Atem of the current situation. Heishin and the High Mages have taken control of six of the Millennium Items, and rules over the Metropolis. He expands his kingdom by constructing shrines guarded by the five High Mages: Martis, Secmeton, Atenza, Kepura, and Anubisius. Each shrine contains one of the Items, while the Millennium Rod is guarded by Heishin and Seto. Muran warns Atem that the way to defeat them is to find the Forbidden Ruins, and passes away. Atem is transported back to the Shrine of Glory, which is abandoned. He then travels into the old city, and ventures into the old dueling grounds, which are destroyed. Jono sees him and is jubilant that he survived, and brings him back to the new dueling ground, where he is reunited with Teana and the other villagers, who are hiding underground. Jono tells Atem how the Mages destroyed the card shop and dueling grounds because the villages couldn't locate him. Everyone is relieved that Atem survived, and Jono briefs Atem on the political situation, and how the Mages, led by Heishin, govern the land from the Vast Shrine of Darkness. Atem leaves and visits the old palace, which is completely destroyed. He meets a Mage Soldier inside, who Atem defeats in a Duel and starts searching the room. He finds a map that depicts an area known as the Forbidden Ruins. He travels to the Valley of the Kings, where he meets the tomb keeper, Sadin. Sadin takes the map and directs him to the Forbidden Ruins, where Sadin points out a map and drawing on opposite walls. After viewing the drawing and ascertaining nothing, Atem looks at the Map while Seto sneaks up behind them and tells them that the Map reveals the location of the High Mages and the Millennium Items. After Seto urges Atem to defeat the High Mages, Sadin yells at him to leave and advises Atem to proceed with caution, since Seto is an enemy and any positive action on Seto's part could be equally dangerous. After defeating two of the High Mages, Atem decides to take a break at the Hidden Dueling Grounds, and discovers that Teana was kidnapped by Seto. Atem and Jono head to the Dark Shrine, which is unguarded, and storm the building to discover a labyrinth guarded by a Labyrinth Mage. Atem duels and defeats him, and tries to navigate the labyrinth. Depending on how the player navigates, he may or may not face more Labyrinth Mages. After passing the maze, they find Seto and Heishin with some aides, holding down Teana. Heishin briefly contemplates the existence of the Prince and the Puzzle, and commands Seto to duel Atem and secure the Puzzle, which would be Seto's reward for victory. Seto drags Teana into a secret room and duels Atem, using incredibly strong monsters and strong magic cards before finally losing to Atem for the 2nd time. Seto gloats, stating that the High Mages won't stand a chance against Atem and departs. Teana thanks Jono and Atem for the rescue, and as they travel back to the Hidden Dueling Grounds, wonders why Seto was gloating after his loss, remarking that he "seemed to have a different agenda", while Jono tells Atem to be cautious as they part ways. Atem finds and defeats the remaining High Mages, gaining a total of 6 out of 7 Millennium Items. Seto then sneaks up behind Atem again and tells him to defeat Heishin by accessing the now unguarded Dark Shrine. After returning to the Hidden Dueling Grounds, the villagers and Jono and Teana congratulate Atem on his victories and hope for a better future. He then heads for the Dark Shrine located north of the dynasty. Seto shows up in the grand hall, and shows Atem a hidden door that leads directly to Heishin's throne. Seto also warns Atem that Heishin is guarded by mages who have sworn to defend Heishin to the death. Atem passes through the door and is accosted by Neku and Sebek, whom he duels and defeats on a Darkness terrain. Finally, Heishin enters and climatically duels Atem for the second time. Atem defeats him and Heishin is promptly knocked unconscious. Seto enters the room brandishing the Millennium Rod, stating that all of the Items have been gathered in one place, and should be brought to the Forbidden Ruins. Seto finally reveals his hand, stating that he only encouraged Atem to gather the items to save Seto the trouble of doing it himself. Seto then pushes a false stone, revealing a hidden chamber with a statue with the DarkNite. Seto then challenges Atem a duel. Atem defeats him. Just as Atem is about to decide whether or not to keep or destroy the Items, Heishin appears, grabs Seto, and motions a sword at his neck, threatening to kill Seto if Atem fails to hand over the Items. Atem reluctantly gives them to Heishin, who places them in the statue, causing the Darknite to be summoned. Heishin commands DarkNite to obey, but DarkNite refuses, and since Heishin lacked the Item to prove his authority, Darknite locks him in a card and incinerates him. Just as DarkNite is about to do the same with Seto and Atem, Atem shows DarkNite the cards Yugi used to acquire the Millennium Items, proving that they had them (or did at one point). DarkNite agrees to duel Atem for his survival, under the conditions that DarkNite departs if Atem wins. Atem defeats DarkNite, but DarkNite does not uphold his end of the deal and transforms into Nitemare. Nitemare challenges Atem to another Duel. Nitemare is finally defeated. Seto escapes and is never seen again. Atem orders the Forbidden Ruins buried, and claims the rightful throne, ruling Egypt as a great king. There are 722 cards to collect in the game. If a card is permanently obtained, it will be added to the player's Chest or Deck and can be viewed in the "Library" menu. Cards may also be temporarily obtained during Duels, in which case the player may use it until the end of the Duel and will not have it in the Deck or Chest afterwards. Temporarily obtained cards will contributed to the card completion figure and can be viewed in the "Library" menu, where their card icon will be semi-transparent. Since the PocketStation was only released in Japan and only capable of connecting with the Japanese version of the game, some methods of obtaining cards could not be conducted in other versions of the game. Because of this some cards cannot be feasibly obtained in those versions. The only method of getting them is to pay 999,999 Star Chips at the Password menu, a feat which even in the event of non-stop playing would take years to complete. The player starts with a Deck of 40 cards, which are randomly selected from a pool. When the player wins a Duel, they are awarded a card. Each opponent has three different pools of cards. The players ranking determines which pool they will receive a card from; one pool is for S and A Power rankings, one is for S and A Technical rankings and one is for B, C and D rankings. Each card in a given pool is assigned a probability out of 2048 of being awarded. Most cards in the game can be unlocked using a password. The passwords are eight-digit numbers found in the bottom corner of OCG/TCG cards. Once the password is entered, the player may pay a number of Star Chips to buy the card. Star Chips are won by defeating AI opponents. Each win rewards the player between one and five Star Chips. The same card cannot be purchased more than once. A number of cards have a Star Chip cost of 999,999. Even in the event of non-stop playing, it would take a person years to earn this much. The unrealistic cost is to force the player to use other methods to acquire those particular cards. Players can trade cards between two different saved games, by inserting a second memory card into the console and entering the "Trade" menu. It is not necessary for each save to trade an equal number of cards, nor is it necessary to leave one save with enough cards to build a Deck. It is impossible to trade with another player with the same ID. This prevents players from simply copying their saved game to another memory card and trading over cards that they wish to duplicate and prevents them from spending Star Chips on the copied save and trading the purchases back to the original save at no expense. However this can be bypassed by trading onto a third memory card as an intermediate step. Another exploit is to repeatedly start new games on the second memory card and trade all the Starter Deck cards back to the first memory card, effectively giving it 40 cards at no cost. Cards can be fused together using the PocketStation. However this can only be done in the Japanese version of the game. A Fusion can be conducted by placing a card from the hand on top of a card on the field or by selecting a number of cards from the hand, which will attempt to individually fuse in the order selected. A Ritual Summon is conducted by activating a Ritual Card, while the player has three specific monsters on the field. The three monsters will be sacrificed and a new monster Summoned. If the three specific monsters were not on the field, the Ritual Card has no effect in the Duel. 356 "Super War-lion" 673 "War-lion Ritual" 201 "Frenzied Panda"
357 "Yamadron" 366 "Yamadron Ritual" 029 "Mountain Warrior"
101 "Wings of Wicked Flame"
360 "Zera The Mant" 671 "Zera Ritual" 085 "King of Yamimakai"
298 "Wicked Dragon with the Ersatz Head"
362 "Millennium Shield" 665 "Curse of Millennium Shield" 255 "Prevent Rat"
364 "Black Luster Soldier" 670 "Black Luster Ritual" 027 "Beaver Warrior"
038 "Gaia the Fierce Knight"
365 "Fiend's Mirror" 674 "Beastry Mirror Ritual" 186 "Fiend Refrection #2"
374 "Gate Guardian" 667 "Gate Guardian Ritual" 371 "Sanga of the Thunder"
380 "Blue-eyes Ultimate Dragon" 675 "Ultimate Dragon" 001 "Blue-eyes White Dragon"
701 "Performance of Sword" 676 "Commencement Dance" 249 "Water Omotics"
702 "Hungry Burger" 677 "Hamburger Recipe" 014 "Battle Steer"
703 "Sengenjin" 678 "Revival of Sennen Genjin" 003 "Hitotsu-me Giant"
704 "Skull Guardian" 679 "Novox's Prayer" 160 "M-warrior #1"
705 "Tri-horned Dragon" 680 "Curse of Tri-Horned Dragon" 006 "Feral Imp"
571 "B. Dragon Jungle King"
706 "Serpent Night Dragon" 691 "Revived of Serpent Night Dragon" 168 "Darkfire Dragon"
294 "Dragoness the Wicked Knight"
604 "Obese Marmot of Nefariousness"
708 "Cosmo Queen" 698 "Cosmo Queen's Prayer" 266 "Princess of Tsurugi"
638 "Queen of Autumn Leaves"
709 "Chakra" 694 "Resurrection of Chakra" 178 "Claw Reacher"
710 "Crab Turtle" 692 "Turtle Oath" 089 "Catapult Turtle"
715 "Psycho-Puppet" 695 "Puppet Ritual" 166 "Mysterious Puppeteer"
716 "Garma Sword" 697 "Garma Sword Oath" 239 "Vishwar Randi"
717 "Javelin Beetle" 696 "Javelin Beetle Pact" 052 "Hercules Beetle"
718 "Fortress Whale" 700 "Fortress Whale's Oath" 436 "White Dolphin"
719 "Dokurorider" 699 "Revival of Skeleton Rider" 146 "Temple of Skulls"
720 "Mask of Shine & Dark" 693 "Contruct of Mask" 102 "Mask of Darkness"
722 "Magician of Black Chaos" 721 "Dark Magic Ritual" 007 "Winged Dragon #1"
The game does not use rules from the Yu-Gi-Oh! Official Card Game. Its rules more closely resemble the ones featured in its predecessor Game Boy games, Yu-Gi-Oh! Duel Monsters and Yu-Gi-Oh! Duel Monsters II: Dark duel Stories. A player's Deck must contain exactly 40 cards. A Deck can have up to 3 copies of the same card, except the "Exodia" pieces, which are limited to 1 each. Any of the game's 722 cards may be included in the Deck, if the player has a copy of them. It is still possible to use cards not included in the Deck by forming them through temporary means. Each player starts with 8000 LP. Players draw until they have five cards in their hand at the beginning of each turn. A combination being set up. The "raised" cards are the ones about to be combined. The attached numbers dictate the order they are to be fused. Players can play one card from their hand per turn or combine any number of cards from their hand and play the result of the combination. 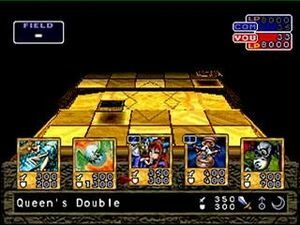 If the player chooses to play a combination, they specify the order in which they wish to attempt to combine the cards. The game will attempt to combine the first two, then attempt to combine the next card with the result of that combination, etc. Cards can be played in either an unoccupied zone on the player's side of the field or top of a card in an occupied zone on their side. If the card played is a Monster Card, it can be only be played in a Monster Zone. If it is a non-monster, it can be played in the Spell & Trap Zone or placed on top of a monster in an occupied Monster Zone. When a card is played on top of another card, a combination will be attempted. If the combination is a legitimate fusion, the two cards will be combined into card. If one of the cards is an Equip Magic Card and the other is a legitimate target, the target will be powered up by a number of levels, depending on the card's effect. Each level increases the card's ATK and DFD by 500. If the combination is not legitimate and only one of the cards is a monster, the monster will be kept and the other card will be discarded. Otherwise, whichever card was played first will be discarded. When a card is played, the player chooses if they wish to play it face-up or face-down, affecting the opponent's ability to see what the card is. If the card is a monster, the player chooses which one of its two Guardian Stars it is to use. Each turn, the battle positions of monsters can be changed multiple times. If the card attacks, the battle position cannot be changed again that turn. Players may activate Magic Cards that they have played on the field, which will activate the card's effect. If a Trap Card is played, it will remain on the field until a condition specified on the card is met, causing it to activate automatically. Players may activate Ritual Cards they have played. If they have three monsters, specifically required by the Ritual, on their field, the Ritual Card will combine them into one other monster. If the three specific monsters were not on the field, the Ritual Card has no effect. If a Field Magic Card is played, the terrain covering both players' sides of the field will change. Certain monsters gain 500 ATK and DFD depending on the terrain. If a monster is put in Attack Position, it can attack monsters on the opponent's side of the field. If there are none, the monster may attack the opponent directly. When a monster attacks a player directly, the monster's ATK is deducted from the LP of the attacked player. When a monster attacks a monster with an opposing Guardian Star, the monster with the superior Guardian Star gains 500 ATK and DFD. When a monster attacks an Attack Position monster, the monster with lower ATK is destroyed and the difference is deducted from the LP of the controller of the destroyed monster. If both monsters have the same ATK, they are both destroyed. When a monster attacks a Defense Position monster: If the attacking monster's ATK is higher than the defending monster's DFD, the defending monster is destroyed. If the attacking monster's ATK is equal to or lower than the DFD of the defending monster, the difference is deducted from the LP of the controller of the attacking monster, and neither monster is destroyed. The opponent's LP are reduced to 0. The opponent cannot draw a card. The player has all five "Exodia" pieces in their hand. After each battle against an AI opponent, the player is awarded a card and a number of Star Chips, each depending on the ranking that they achieve. The rank is determined based on a score the player is given. The following background music is played during the game. The names listed are unofficial. "DarkNite and Nitemare Poly Mode"
The Japanese version of the game came with three promotional cards, randomly selected from "Zoa", "Metalmorph", "Harpie's Pet Dragon", "Metalzoa" and "Red-Eyes Black Metal Dragon". The North American English version of the game came with the promotional cards FMR-001 "Red-Eyes Black Metal Dragon", FMR-002 "Harpie's Pet Dragon" and FMR-003 "Metalmorph". The European versions of the game did not come with any promotional cards. Despite its inclusion as a promotional card, "Red-Eyes Black Metal Dragon" is not featured in the game. This page was last edited on 25 April 2019, at 01:17.